The page Umbrella Corporation contains mature content that may include coarse language, sexual references, and/or graphic violent images which may be disturbing to some. Mature pages are recommended for those who are 18 years of age and older. Create and control deadly viruses (the T-Virus, the G-virus and the T-Veronica Virus) for their own purposes. ~ A company slogan of Umbrella Corporation. The Umbrella Corporation is one of the most powerful companies on Earth and was a huge organization that acted as the faceless villains of almost all Resident Evil games, it is so massive that it was termed as a mega-corporation: having subdivisions in almost every business imaginable and even having its own organized paramilitary force. This corporation consists of about 92 members. By contrast, Umbrella is the central antagonistic company of the Resident Evil franchise via film and games. Umbrella was the most infamous company for being largely responsible for the infection that sweeps across Raccoon City (and other areas of the world) due to the creation of several highly volatile mutagen viruses and parasites - the most famous being the G-virus, t-Virus and Nemesis Parasite. Umbrella's true nature was revealed to the public after the events of Raccoon City but was able to stay afloat using several scapegoats. After Jill and Chris infiltrate Umbrella's Russian stronghold and destroy T-A.L.O.S., Albert Wesker uses Chris and Jill's distraction to kill Sergei Vladimir and stole Umbrella's data from the Red Queen and presents the evidence of Umbrella's actions to the U.S. government. With the evidence being given, the U.S. government orders an indefinite suspension of Umbrella's practices and soon its stock prices plummeted, and Umbrella was finally finished. In addition, many of the game's major antagonists have connections to the Umbrella Corporation, making it arguably the true antagonist of the series (though some would say that title belongs to Albert Wesker). According to James Marcus, the Umbrella's 'employee pledge' is stated as being "Obedience Breeds Discipline, Discipline Breeds Unity, Unity Breeds Power, Power is Life". It is unknown if this is the motto for the public or if it is used purely within the company, due to its ominous sound. In the Resident Evil movie series including Resident Evil: Apocalypse, the Umbrella Corporation's official and public motto was "Our business is life itself". In the game Resident Evil: Umbrella Chronicles, Albert Wesker states that Umbrella's motto was "Preserving the health of the people". This also appears on Umbrella's official website in the non-canon Inserted Evil ARG. Umbrella was founded in 1968 by Oswell E. Spencer, Edward Ashford and James Marcus as Umbrella Pharmaceuticals after the Progenitor virus was discovered the year before. Another starting member (though not referred to as a co-founder) was a student of Marcus', Brandon Bailey, who was with Marcus and Spencer when they first discovered the Stairway of the Sun flower that they used to extract the Progenitor virus. Ashford died from exposure to the virus, and Bailey was effectively exiled to the Umbrella Africa Laboratory, where he would send virus samples to Dr. Marcus' newly built Umbrella Executive Training Center. During 1969, Edward's son Alexander began the construction of the Antarctic Base, attached to which was a research center where he began development of his "Code: Veronica" project, under which he began research into the gene that controls intelligence. Using this research, Alfred and Alexia would be born two years later. To obtain new information on Progenitor, Marcus used the virus on several of his students. They could not survive its effects and died, their dead bodies were dumped into the Water Treatment facility. Marcus injected several leeches with Progenitor in 1978 and witnessed the creation of a new strain which he named the "t-Virus". Later that year, the Training facility would be closed and Marcus' two prized students: Albert Wesker and William Birkin, would be moved to the nearby Arklay Laboratory under Spencer's mansion. In 1978, Marcus yet again found evidence of tampering. In his increasing paranoia brought on by his quest for glory and isolation from mankind, he wrote in his diary that Albert and William were the only humans he trusted. His trust in them would be betrayed 10 years later, however, as the two would - under direct orders from Spencer, himself - have him assassinated by a Special forces unit and dumped into the Water Treatment Facility. Credit for "t" would be taken by William Birkin. His trust in Birkin would also render hiding the source of "t" - the Leeches - useless. However, by this point in time Birkin had little care for "t", having discovered the G-virus in the body of Lisa Trevor, the daughter of George Trevor, still kept in the estate as a guinea pig for their twisted experiments. Marcus was completely restored 10 years after his death by the Queen Leech. He would exact his revenge on Spencer and Umbrella by releasing "t-virus" into the Arklay Laboratory's water supply, turning the facility personnel into zombies and leaving the laboratory and mansion in complete chaos, allowing for the team's extremely dangerous research specimens to escape into the surrounding area. Birkin and Wesker used this as a diversion for their own plans to leave Umbrella, taking their research data with them. Wesker, having formed Raccoon City's elite S.T.A.R.S. unit two years prior, would develop a plan to lure the team to the Mansion and obtain battle data from the conflict that would surely follow. Although the Tyrant was deployed - leading Wesker to falsify his death as a realistic "unforeseen side-effect" of releasing it - both the laboratory and the rampaging Tyrant were destroyed by S.T.A.R.S. Alpha Team, before making their escape back to Raccoon City with a single Bravo Team survivor. Wesker was forced to go into hiding for a number of months, using his operative Ada Wong to carry out his objectives, including the recovery of Birkin's G-virus. Two months after the Arklay incident, William Birkin finally perfected the viral strain that he had been toiling to achieve since obtaining Marcus' research so many years before. Birkin planned to use the virus to force the Umbrella Corporation into allowing him onto their executive board, but then changed his plans when he found that selling it directly to the U.S. Government would prove far more profitable - though this is based on Umbrella's opinion. Umbrella deployed its elite U.S.S. Alpha Team (a paramilitary black ops unit created for Umbrella's most clandestine purposes) led by HUNK in a desperate bid to stop Birkin from handing over his ultimate creation. Although Birkin was mortally wounded in the ensuing conflict and the G-virus was successfully recovered by HUNK's team, he was able to inject a remaining sample into his own body and devastate most of the team before they could make their escape. This event would be indirectly responsible for unleashing the t-virus into Raccoon City. HUNK recovered a sample of the virus, recovered it, and gave it to Umbrella. While the Arklay incident had been relatively isolated and concealed from the public and Umbrella's control over key government and law enforcement personnel had ensured that any record of what had occurred could be safely swept into obscurity, they were now faced with an entire city infected with "t-virus" and a trail leading directly back to the Umbrella Corporation. This would prove exceedingly difficult, even for Umbrella, to make simply disappear. Umbrella fell from grace on September 24, 1998, when the t-virus turned a large percentage of the population into Zombies. The morning after, the U.S. Government had the city limits bordered off by the military, whilst they began an investigation into the matter. Umbrella itself was divided on the issue of Raccoon City. Its virologists within the limits spent their time researching a cure, whilst weapons researchers had experimental B.O.W.s sent in to receive combat data on their effectiveness at killing civilians. The Umbrella Biohazard Countermeasure Service (UBCS) was sent in to evacuate civilians, whilst "Monitors" installed within the four Delta Platoons gathered the combat data, sacrificing their comrades to save their own lives, where they would receive a very generous sum for their data. Meanwhile, some employees even turned on each other. Dr. Frost was killed by Monica for being in the way of a "G"-sample, whilst Yoko Suzuki - a t-virus test subject used in an experiment two years before - lost her Umbrella security card to Monica, who would soon walk right into the infected Birkin and become a host for his offspring. Former Umbrella researcher Greg Mueller had a University professor create a cure - Daylight - before the Outbreak, knowing what would soon happen. He was wanted by Umbrella, not due to "Daylight", but because of an experiment Greg took with him when he left - an experimental Tyrant. "Thanatos" was activated and sent outside to kill UBCS personnel attempting to claim it. Unbeknownst to him or his creation, the supervisor "Nikolai Zinoviev" had infiltrated the building. Whilst discussing his plan with a few survivors, Nikolai shot through the ceiling, through Greg's head, and out of his neck. His death was instantaneous. The University was destroyed by C-4 charges, whilst the Tyrant was killed by "Daylight" nearby. It was a fitting end to the beast, as one of the ingredients of the anti-virus was the creature's very blood. Elsewhere in Raccoon, an executive had a UBCS team on the lookout for renegade USS member Rodriguez, who had stolen the executive's "package". Rodriguez was waiting for a researcher - Linda - to return from an Umbrella facility as she left something important behind. This was AT1521 - Umbrella's answer to Daylight. After recovering it, another researcher - Carter - released the experimental "Tyrant R" to kill off the Hunter R running amok. Although seemingly taking orders from Carter without question, it had already counted the man as a threat - a bomb had been planted in the monster, and Carter had the detonator. The creature's betrayal led to the destruction of AT1521, leaving Linda to have to remember how to synthesize it again all by herself. Eventually, Umbrella was unable to delay the President's decision to authorize the Sterilization Operation. With little time left, all paramilitary forces were ordered to clear out. Carlos Oliveira and Jill Valentine were rescued by Barry Burton, whilst Nikolai attempted to escape on his own via helicopter. Rodriguez was forced to abandon Linda and pull out, leading to an attempted shoot down by an Umbrella Executive. The rocket missed, but the helicopter's sudden emergency maneuvers led to the loss of the "package", revealing a horrific creation known as "Nyx". The UBCS team and Tyrant R were defeated by Nyx and absorbed into its body. In the end, Nyx would eventually be killed by a group of survivors, who successfully escaped Raccoon City by HUMVEE with Linda. Still, this was not the last story to tell of Umbrella's actions in the city. Leader of Umbrella's paramilitary organizations, Sergei Vladimir, stole the U.M.F.-013 storage system - also known as the Umbrella Archives. Ada Wong, who had retrieved the G-virus, was rushing to leave the city, but instead clashed with the revived Tyrant R. In the end she defeated the creature and escaped the city on Sergei Vladimir's helicopter, witnessing the destruction of Raccoon City. It would take many years, and many more tragedies, to finally gather enough evidence to condemn Umbrella. Umbrella's fortunes failed to improve in the time shortly after the Raccoon City incident. The U.S. government changed its opinions of the company - while it had initially desired to obtain Umbrella's secrets for its own military projects, it was now in full condemnation over Umbrella's failure to contain the situation (the U.S. government's involvement in Raccoon City was carefully omitted). A "suspension of business decree" was imposed on Umbrella U.S.A., Inc., preventing any further presence in the US stock market. Under threat of financial ruin, Umbrella filed an appeal to overturn the decision. On Sheena Island, an undercover investigator, Ark Thompson, operating on behalf of Leon S. Kennedy, succeeded in destroying Umbrella's Tyrant production plant after Vincent Goldman, The Umbrella Director of the island, unleashed the t-virus on its citizens. Shortly afterwards, Claire Redfield broke into Umbrella's Paris facilities in search of her brother and was captured and sent to Umbrella's illegal prison camp on Rockfort Island. While there, she witnessed Albert Wesker attack the island in search of the t-Veronica virus, another descendant of Progenitor. Escaping the island, she found herself trapped at the Antarctic Base, where Edward Ashford's granddaughter, Alexia Ashford, awoke from a self-induced coma with the desire to establish a new order. By 2002, both Umbrella and the US had been forced into potentially damaging positions. Over the years, Umbrella had denied liability for the Raccoon City incident on the grounds of US government involvement, which the US government itself denied, arguing that all of Umbrella's testimonies were entirely fabricated. While the general public opinion was slowly moving in support of Umbrella's testimony, the company itself was still closing on financial ruin without access to Wall Street. The situation had become noticeably grave when US intelligence discovered that a rogue former employee was selling B.O.W.s to a South American drug lord, Javier Hidalgo. Later in the year, USSTRATCOM and Chinese intelligence were called in to investigate the theft of t-virus and G-virus samples from an Umbrella Europe facility by yet another person - the former R&D executive, Morpheus D. Duvall, who was used as a scapegoat for the May 1998 leak. Duvall took the United States and China hostage, threatening to fire t-virus missiles from an undisclosed silo in the hopes of obtaining a ransom of $5 billion in return for their safety. While USSTRATCOM succeeded in taking out Duvall and preventing a missile attack, the Paraguas Line Company cruiser Spencer Rain was lost, with its entire crew and passenger complement becoming infected and subsequently killed during a viral outbreak. The final blow to the company would come in February 2003, when a private anti-biohazard paramilitary force was sent to the Caucasus in the Russian Federation in response to rumors of a new B.O.W. being developed there by Umbrella. Leading the attack were Chris Redfield and Jill Valentine, who eventually reached the Russian facility's underground chamber, where they fought Umbrella's final weapon, T-A.L.O.S., after it was dispatched by Sergei Vladimir. At the same time, Wesker managed to infiltrate the facility a few hours prior to Chris and Jill's arrival, and had one final encounter with Sergei, who then mutated into a new, virus-infected monster. While Chris and Jill destroyed T-A.L.O.S., Wesker managed to extract all data from Umbrella's Red Queen supercomputer, while also erasing any of the memory left within the computer itself, in order to use it against Spencer, thus bringing Umbrella to its knees. Umbrella was finally found guilty soon after the Umbrella Russia incident, after an anonymous notification by Albert Wesker, using the data he had extracted. The U.S. government suspended Umbrella's market trading license pending further investigation into their business practices. While this investigation must have already provided Umbrella with severe financial problems, a worldwide manhunt for surviving founder Oswell E. Spencer sealed the organization's fate. Albert Wesker kept the stolen data in his secret hideout. Wesker had always desired power more than anything in the world, seeking to dominate all for his own gain. He saw Umbrella as power incarnate. His computer had every Umbrella asset stored away safely, and he planned to one day remake the company under his leadership. This new Umbrella would lead the human race into a new, improved era, fixing a world Wesker saw as unacceptable. His vision for the future would go beyond that of Spencer, but he would later discover that they both had much in common, as Spencer had made Wesker who he had become. With its trading completely suspended, Umbrella's shares quickly collapsed, and the company was left bankrupt. With the corporation shut down, a vast amount of the company's biological weapons and virus samples appeared on the black market, birthing an age of bioterrorism. The ultimate irony came to be that the world was safer with Umbrella than without it. In 2005, Umbrella's t-virus was used in a bio-terrorist attack on Harvardville Airport, resulting in a mass infection of the entire terminal. However this time it was caused by a company known as Wilpharma. One of its key employees, Frederic Downing, had stolen both the t- and G-virus samples from his previous employer Umbrella, and had fled Raccoon City. Umbrella's other monstrosity, the G-virus was also used in the same outbreak, and was injected into the body of Curtis Miller. Miller wanted the information about the Raccoon City outbreak released, so that everyone who had wronged him and his deceased family would be arrested. Unbeknownst to him, Frederic Downing was using him to collect G-virus combat data for a buyer wanting the "t" and G-viruses. However, the conspiracy was uncovered by the efforts of Leon S. Kennedy, Claire Redfield, and the S.R.T during the deadly outbreak. Due to Umbrella's use of medicines developed by other pharmaceutical companies, the Global Pharmaceutical Organization worked to prevent further harm from being done to the names of innocent pharmaceutical organizations, and to prevent the further distribution of B.O.Ws, by forming an international organization called the Bioterrorism Security Assessment Alliance, or "BSAA", after Umbrella's collapse in 2003. Among the eleven founding members were none other than Chris Redfield and Jill Valentine. In 2007, Umbrella U.S.A.'s assets were handed over to former employees of the original company as new chief executives and formed into a PMC called "Blue Umbrella". Its stated purpose is to atone for the crimes of the old executives and redeem Umbrella's "dark legacy" by exclusively combating bioweapons through both military ops and the development of cutting-edge anti-B.O.W. weapons, tactics, technology and treatment. The company keeps their original name so the public will always know that the company is cleaning up the mess they started. Security Forces: PrivSols for the task of guarding facilities. Umbrella owns and utilizes several paramilitary units to ensure the stability of the organization during their viral experimentation. Umbrella Security Service: Assigned to missions of hostage rescuing and antiterrorism. Umbrella Biohazard Countermeasure Service: Assigned with combating all the escaping B.O.Ws. Trashsweepers: An alternative B.O.W force using specially trained B.O.Ws. In the movies, the company was founded by two British scientists, Dr. Alexander Roland Isaacs and Dr. James Marcus. With Dr. James Marcus's creation of the T-Virus, a virus which can revive dead cells in it's hosts, the company rose to power as a worldwide frontier of medical and computer technologies. When Dr. Isaacs saw that they could use the virus to create enhanced military weapons, Dr. Marcus vetoed on the idea, prompting Dr. Isaacs to have Dr. Marcus assassinated by his loyal subordinate, Albert Wesker, and raised Dr. Amrcus's daughter Alicia under his care and through her secretly controlled all of the Umbrella Corporation. The company is known for its advanced medical, technological and militaristic resources as well as have nearly limitless funds and resources, being able to create H.I.V.E., a top secret state-of-the-art Umbrella Base. The company obviously holds incredible political power, given as how they were able to take over Raccoon City legally using their own combat force during the T-Virus outbreak in the city. The company is also pioneered in cloning technologies, having created limitless amounts of clones, which are implanted with enough memories to make them loyal to Umbrella as well as make them excel at whatever purpose they were designed for, whether is be R&D unit, support unit, combat unit, development unit, security unit, intel unit as well as a science division. In the second "beta" Dead Rising video, Umbrella is briefly mentioned as it was not involved with the Willamette outbreak (and the series at all). In the 2005's Resident Evil 4 E3 teaser, it is said that the Umbrella Corporation was dismissed in 1989 instead of 2003. 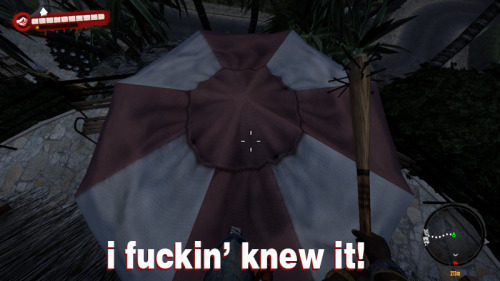 In the videogame Dead Island, the umbrellas are the same pattern to that of the Umbrella Corporation logo. An obvious reference to the Resident Evil series (seen in a website) . In Grand Theft Auto: San Andreas, there is a company called ZomboTech. It could be another reference to Umbrella.